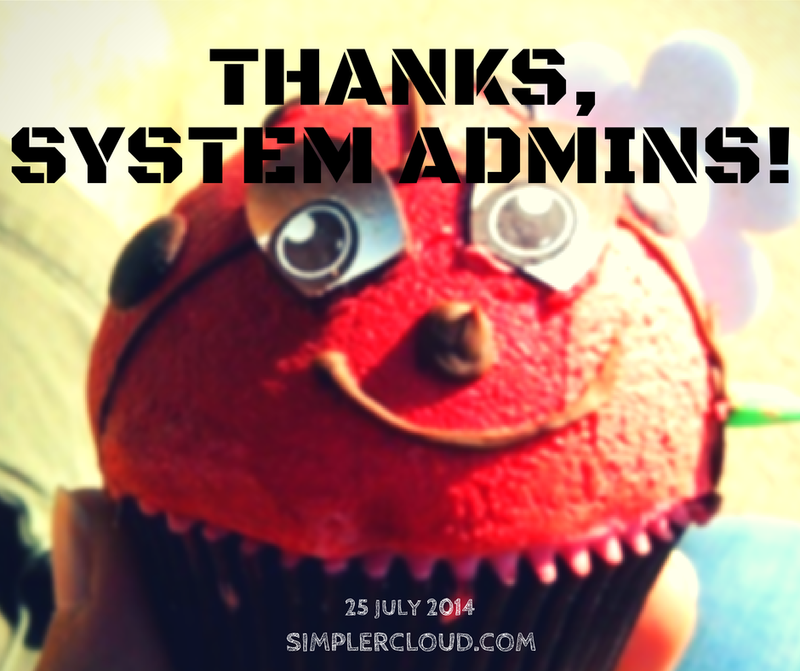 Today (25 July 2014) is System Administrator Appreciation Day, which is an event to show appreciation for the work of system administrators (or sysadmins) and other IT workers. It is celebrated on the last Friday of July every year, since the year 2000. As a hardened, 15-year veteran system and network administrator, I know first hand about the many tasks a system administrator needs to do, the skill sets and knowledge he needs to learn, and the daunting tasks and long hours he has to keep. Yet, sometimes, “normal” users don’t understand their system administrators as well as the system administrators know their users. And that is why System Administrator Day is an awesome day that everyone should celebrate. What do system administrators do, and why do we need to appreciate their work? According to Wikipedia, a system administrator is a person who is responsible for the upkeep, configuration, and reliable operation of computer systems; especially multi-user computers, such as servers. In layman’s terms, system administrators manage all the servers, network equipment and any other IT infrastructure for an organisation. In many companies, those system administrators are part of the organisation’s IT team or department. They are the one who setup the network within the organisation, installing mail servers, file servers and many other servers required by the organisation, installing all the required applications to support the organisation’s business, applying operating system updates, patches and configuration changes, among others. They are responsible to ensure that all the services are running. For example, system administrators are responsible to ensure that Internet connection in the office is working, the mail server is running and processing emails that are sent and received by all staff within the organisation. Without these basic operations, you will not be able to do anything which requires Internet connection, such as surfing the web or checking your emails. And even if your Internet connection is working, you won’t be able to send/receive emails if your organisation’s mail server is down. Server administrator – maintains the operating system of the servers, and to some extent, the applications as well, such as the mail services, the web services, etc. He is also in-charge of troubleshooting any hardware, operating system or application related problems. Network administrator – maintains the network infrastructure, such as the routers and switches, and troubleshoot network-related problems. Database administrator (DBA) – maintains the database system used by organisation. In bigger organisation which uses bigger and more complex databases, there is a DBA which specifically responsible for this role. In smaller organisation, this role would normally be shared by the server administrator. Unlike many other professions like pilots, medical doctors, etc, there is no single path of training to become a system administrator. While most system administrators have a degree in computer science, information technology or any other similar fields, anyone can actually become a system administrator by self learning and, in most cases, on-the-job training. There are some training and certifications intended to specific IT fields such as Microsoft training and certification for Microsoft-based systems and applications such as Microsoft Windows and SQL, Cisco training and certification for Cisco network, etc. Most system administrators are always on-call, since they have system and network infrastructure which needs to run 24×7. That said, a system administrator can get paged or called at 3am in the morning when a mail server goes down, or when the Internet connection suddenly stops working. But the most important thing is that they are the ones who must ensure that all servers are functioning, the network is running and healthy, all the time. That’s why good system administrators are often overworked and very much in demand, and, nowadays, crucial to the success of Internet app, web application and cloud-based companies. And so, way back in the year 2000, a system administrator named Ted Kekatos suggested a yearly day event when everyone can appreciate the work of system administrators by – for example – giving them cake and ice cream and throwing a small party or celebration. This has become an annual event, celebrated every year on the last Friday of July. Today marks the 14th year we are celebrating System Administrator Appreciation Day. Good system administrators never stop learning, and combine multiple skillsets to perform many different and unending tasks. I wish all system administrators everywhere a very happy System Administrator’s Day. Indra Pramana is the CEO of SimplerCloud. You can connect with him @indrapr. This entry was posted in Guides & How-tos, SimplerCloud and tagged cloudstack, database administration, network, network administration, servers, sysadmin, system administration, system administrator day. Bookmark the permalink. Pingback: .. Minda Indra .. » Apa Yang Dikerjakan Oleh System Administrator Sepanjang Hari?